As parents we get bogged down with all of our “Things to do lists” and we kind of forget how to enjoy the small moments. Sometimes all it takes is a moment, a moment to slow down, to open your mind and think like child again. Recently I attended an event in Toronto promoting The Irish Fairy Door Company, it got me excited about being a part of a magical moment for my daughters. We are going to help a fairy find a home with our family. The creators of the Irish Fairy Door Company are from Dublin, Ireland and produced this concept two years ago. Two friends along with their husbands brought to life a magical fairy experience across the globe and launched in Canada. Mastermind is a major retailor, Niamh one of the founders says “it awakes the imagination in a child and parents”. The Irish Fairy Door Company has helped over 500,000 fairies relocate into human homes, classrooms, gardens and woods across the globe. Is it work?Yes it is a bit of work but it is fun! As a parent, you question, what do I have to do?Choose from six different door colours and set your door up at any point in/outside of your house with easy access for your new magical family member. Do I have to remember something?Register your fairy online to receive weekly updates from Fairy Valley and even fun emails from your own fairy filled with activities and special missions. How long do you do this for? 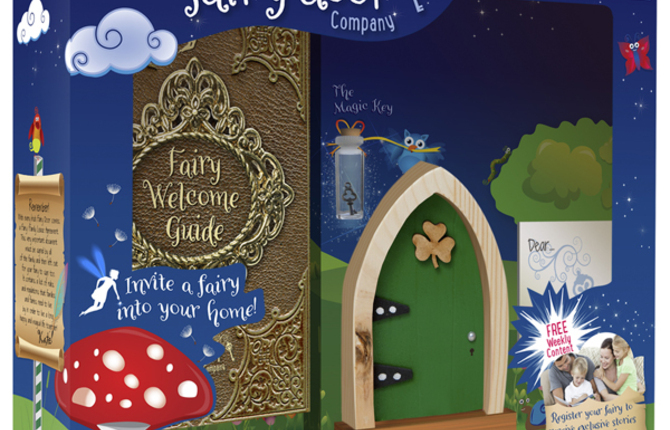 With the Fairy Door Company you can be sure once you sign- up to register your Fairy’s name/ names the founders have your back. Yes they want you to engage with your child and awaken your imagination, however they know it is work and sometimes your fairy has the “Fairy Flu” and can’t write to you for a couple of weeks because they need to rest. I think enjoying a fairy will be fun! I can’t wait. We are looking for One City Parent Reader to awaken their imagination with the Fairy Door experience. They have kindly given us one Door to give away. Only open to Canadian Residents. Please go to our facebook/cityparent to find this contest and leave a comment, your name will be entered into the contest.